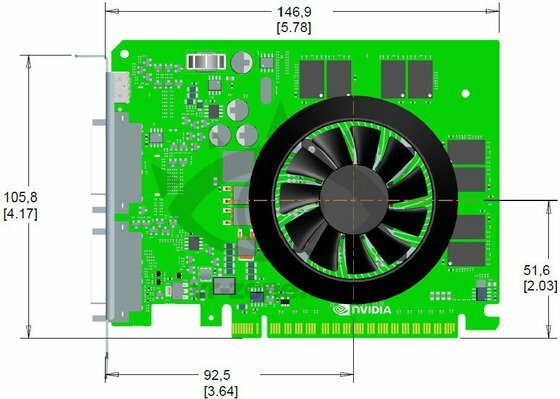 VR Zone got its hands on a drawing of the PCB of NVIDIA's upcoming GK107, an upcoming entry-level graphics card that will ship a variant powered by GDDR3 or GDDR5 and one wit 512MB DDR3 RAM. At first glance, the GK107 PCB and heatsink is very similar to the ones used for the GeForce GT 440 (GF108 based, which the GPU GK107 will replace) with identical dimensions. Like the GF108, the GK107 will feature a 128-bit memory interface. The heatsink + fan system will also be similar - a shroud-less heatsink with an 11 blade axial fan, albeit with minor modifications for GK107. Legacy VGA output will be dropped for 1 DVI-I DL output, 1 DVI-D or HDMI out, and a third port with either mini-DP or mini-HDMI.